The conventional pictures of Scotland are either high on mood or atmosphere, with a lot of mountains; or are packed with posturing pipers and technicolor tartans. But this little nation is a many-faceted place, with lots of landscape variety. So here are some pictures of Scotland from my own collection over the years. And not a bagpiper to be seen anywhere. (Above) Elie, a little resort town on the Fife coast. In tourism trade pictures of Scotland the sun always shines. This picture was taken in November, seconds ahead of a stinging shower of hail. We retreated to a pub that overlooks the shore. There was a roaring fire and we had a fine lunch instead of a beach walk. It is an easy journey from here to St Andrews. (Above.) Looking across Eynhallow Sound from Rousay, Orkney. 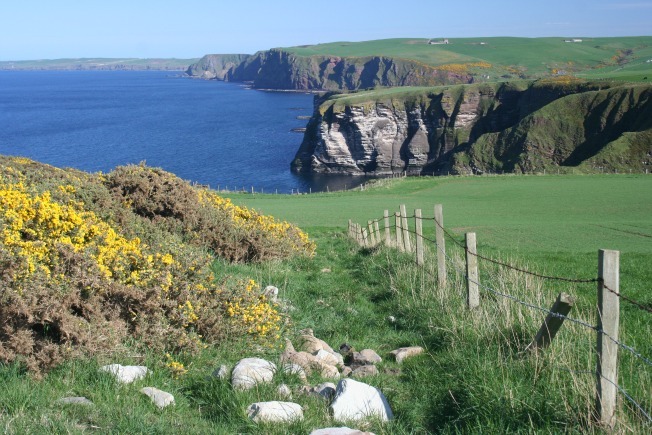 We make no secret of our delight when we get a chance to visit Orkney. It’s the place for different pictures of Scotland – or really, pictures of a different Scotland. There is something very beguiling abut that cool blue northern light. The vivid yellow of our hardy gorse in late spring helps the photographer as well. 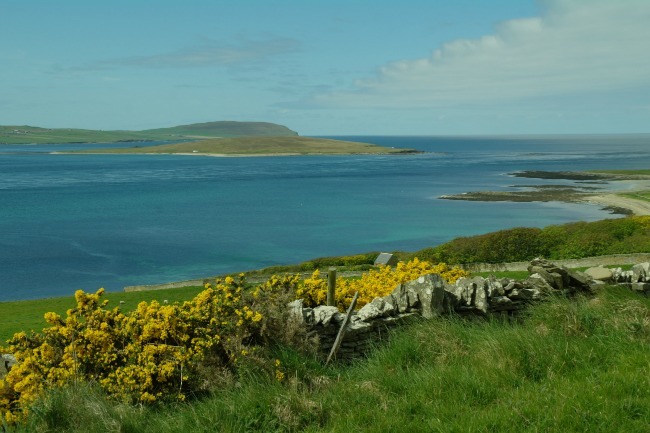 This is taken from the island of Rousay, (from Norse ‘Rolf’s island’) looking across Eynhallow Sound to Mainland (what they call the main island of Orkney). You can day-trip Rousay if you are staying on Mainland. There are regular ferry services. Down by the shore is the extraordinary Neolithic complex of Midhowe - covered in our Rousay page. (Above) Glen Orchy is worth the diversion off the main east-west road to and from Oban. It lies to the north and you can join it east-bound, near Dalmally. It’s very sparsely inhabited today, and it has waterfalls and picnic sites. If travelling east in sunshine, you could stock up with picnic goodies in Oban and have a very fine break by the tumbling waters. Just a thought. (Above) View north across Rannoch Moor from the summit of Beinn Achaladair, one of Scotland’s Munros. Quite high in the picture, in a line upwards from the little dog’s head, is the main road across the Moor, heading for Glen Coe and eventually Fort William. And above that, in the centre, the largest mountain on the horizon is Ben Nevis, the highest in Scotland. Note the orange of the late-flowering montbretia, strictly speaking, crocosmia, a garden escape on Iona as it is on many parts of the mild seaboard. Makes a good foreground though. (Above) The Iona ferry, returning to Fionnphort Mull. It’s late afternoon. The earnest pilgrims, beach-seeking young folk, photographers taking their own pictures of Scotland, tourists and a sprinkling of artists, birdwatchers and not-otherwise-labelled lovers of the western seaboard are all returning across the Sound of Iona. It only takes ten minutes to journey over – but much longer on that sometimes seemingly endless little road that takes everyone back east from the big carpark at Fionnphort, probably to Tobermory. More on the island of Iona here. Everyone is reluctant to leave behind the magic of the west, with the views, the tranquillity, the beaches....and the ruthless west coast midges – the price to be paid for a day that was was calm and still. I feel bad sometimes about cropping pictures. Odd. Besides, the electronic viewfinder in the Samsung (a getting-long-in-the-tooth NX10 for that shot, since you asked) isn’t as clear as a full-size SLR screen – so sometimes I am not quite sure what I've got till I download. (Above) Looking south over Loch Tay from a point a few miles to the east of Killin. Scotland is the place for dramatic light effects. But you have to be quick. That little patch of weak autumn sunshine will roll on fast. Just take care how you park if you are trying to catch these fleeting effects! Classic Highland Perthshire: some pasture by the loch-side, but it quickly runs up to marginal high ground. This is near Ben Lawers with its ‘base-rich’ rocks – so it’s a bit more lush than other grazings hereabouts. (Above) Looking east along the Moray Firth coast from the path that leads up to Troup Head, Aberdeenshire. This far north-eastern knuckle of land is also called Buchan. It doesn’t often feature in classic pictures of Scotland! It is, in fact, a world away from the ‘wet deserts’ – the heathery, craggy wastelands of the west that we prefer in our pictures of Scotland. As this photo suggests, the east hereabouts is open to the winds, and intensively farmed right up to the cliff edge. However, the cliffs and hidden coves, as well as the steep-sided little valleys (hereabouts called ‘dens’) that my old geography teacher referred to as ‘glacial out-flow channels’, hold plenty of wildlife interest. (Above) Looking west from the Knock Hill, Crieff. 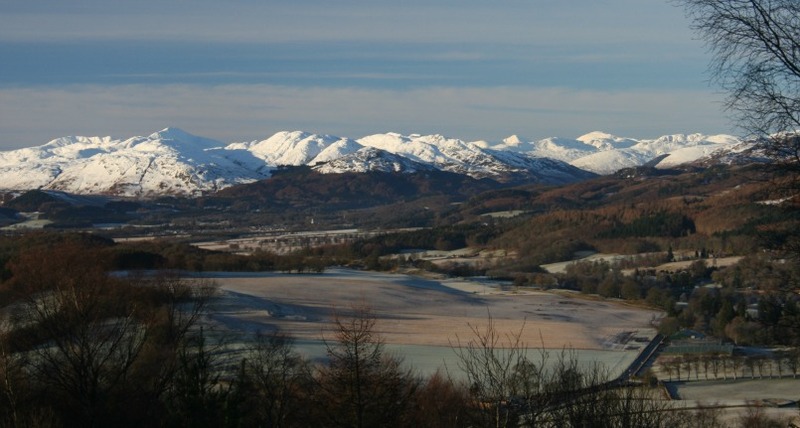 Frost coats the low ground of Strathearn and the snow line is well down on the hills. It’s deepest January. The Knock Hill in Perthshire always gives great views, whatever the season – a panorama in all directions, Highland and Lowland - and it’s got one of those view indicators to keep you right as well. Definitely a good location for classic pictures of Scotland. More on the town of Crieff on the link above. It was once noted for its autumn tryst in the days of cattle droving.